Thought I would post a pic of what DD game set I use. I'm not sure I should have even called the post a "collection" as I am sure it's pretty small compared to some your guys piles! 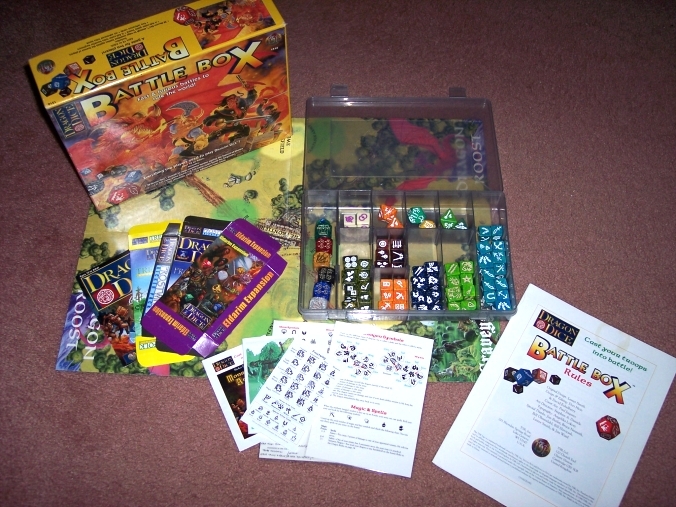 This is the 1996 Battle Box starter set. I came into this through my brother. He (and a friend of ours that I still game with) are very avid gamers so my brother had a huge collection of boxes, etc. A few years ago he decided to thin out his piles a bit and asked me to sell some of them on eBay. In there were things like first editions of Squad Leader, Vampire, D&D and such, so it went well on the site. I remembered this Battle Box game as we used to dabble with it years ago (before he moved to FL) so I asked him if I could keep it as I thought it would be fun to tinker with now and then. So now I have it! Over the years I have added some kicker packs (Amazons & Monsters, Treefolk, Frostwings, and most recently Eldarim). I plan on adding some more to expand out. I like the Battle Box board because instead of just having sheets or mats for the players, there is a full terrain with the three battlefields, Dragon Roost, Graveyard, etc. My friend that I still game with has always been big into terrain and miniatures so I am used to having something to look at instead of just some sheets and a table top! So the BB works for me. Anyway, check it out and enjoy and post if you have a Battle Box or want to comment! Perfect day: DragonDice Battle Box, chilled brews, and heavy metal tunes! I love the Battle Box mat! That's also how I got into the game, initially, with the Battle Box. Now I have way too many dice, and want way too many more. One thing to keep in mind, the mat that comes with the Battle Box mixes up the Horde and Campaign armies. Those should be swapped. Also, make sure you have the latest ruleset. Quite a bit has changed (and for the better IMO) since Battle Box. Seeing this picture excites me and makes me want to get Dragon Dice™ to the table again! I grabbed the latest rule set a few weeks ago on the site here and have been going through that. I also have been grabbing race info sheets which have been very helpful as the pamphlets that come with the kickers are somewhat limited. A very good start to a collection! Not really, they are dwarves, but were company dice. maybe one day I can get to that number of dice! Holy cubes Batman, that's a bunch of dice! Looking at the Scalders on the site now, think that will be my next purchase and addition!